Our employees are what make Northern Engraving and our customers successful. They reflect our core values of Trust, Respect, Innovation, Service and Teamwork every day. It is their hard work and dedication to excellence that make a difference. One person who displays these values is Kathy Danielson at the Sparta, WI Corporate Office location. 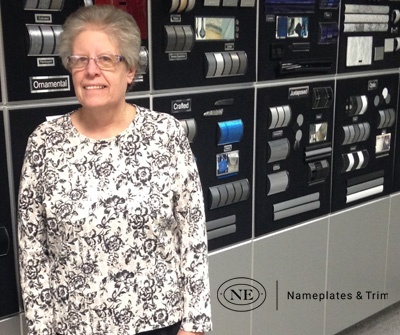 Kathy Danielson was instrumental in setting up the policies and procedures to get Northern Engraving initially certified as a TS 16949 supplier. This came as a natural progression to her background as Inspector, Inspector Foreman, Quality Control, Quality Manager and Corporate Quality Representative before taking on her current position of Buyer at our Corporate Office. “I appreciate working for a company who is stable and has documentation to help each area with their jobs. how you perform your job affects someone else down the line. There is always something new to learn. You have to work together to stay updated and help each other. Policies and procedures are there to help everyone make sure that we produce good parts and get the job done.